Break the Record!! Feel the Next-Generation in R/C. Pick up an M12! This is an Airtronics M12 2.4G FH4T 4-Channel Competition Pistol Grip Telemetry-Capable Radio** with an RX-471 FH4 Super Response Receiver. The M12 is newly-equipped with a 4x higher spec CPU compared to our world champion model, the industry-leading M11X. Brand new from the ground-up, the M12 is the realization of lofty goals to more than double its analysis ablility and speed. An extremely low latency time, as well as operational and innovative features, guarantee the M12 to be the flagship of a new generation of radios, not just for Airtronics or Sanwa, but for the entire R/C industry. The M12 responds at almost "Zero-Latency". What is Zero-Latency? It's a measured total latency speed of under 1ms. That's right, the latency of this radio is UNDER ONE MILLISECOND. What's more, the "feeling" of that type of Zero-Latency is 100% adjustible, allowing drivers to change their driving condition and feel instantly. No other radio has this type of connectivity advantage! The M12's extremely high response time exceeds ALL other radios, and it's all in a package with advanced ergonomics only World Champion Airtronics can deliver. Drive easy knowing you're driving the best! • Model Sort: Allows You to Sort Models in the Model Select List. Put Your Favorites at the Top! *About M12 Response Mode - Please be aware that analog servos will not be compatible with the fastest radio settings: SHR, SSR mode. To prevent risk of trouble, do not use analog servo under SHR, SSR mode. Digital servos, SRG, Digital ERG, SDX can be activated under either NOR or SHR mode. SSR mode is only compatible with SRG/SSR series receivers and servos. 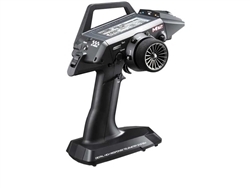 The Airtronics M12 can be operated with all Airtronics 2.4GHz FHSS-2, FHSS-3 and FHSS-4 car receivers: RX-371, RX-442FS, RX-451, RX-451R, RX-461, RX-462, RX-471.